My holiday in Portugal was over and the moment came to say good-bye to my friend Maria Rosa. We stood facing each other. I held her warm, soft hands. “When are you coming back?” Maria Rosa looked at me expectantly. And then rather than saying, “next summer,” I very resolutely, after a short pause, said: “Very soon after Christmas.” Now her face gleamed with pleasure, and she hugged me tightly. “Very good! You know, I am very old and you never know ...” - And then we both laughed, because the time would be so short until we saw each other again. On the day, when I was standing in front of her door again, it was cold, windy, and rainy. I knocked on it with its butterfly-shaped brass bell and she took slow, shuffling but excited steps towards me. “Quick, come in!” Maria Rosa led me into her kitchen, where a soup simmered on a three-legged stove. She was well over ninety, but still lived alone in her little house and was largely self-sufficient. When we had exchanged stories for a while, she suddenly said with a regretful sigh: “Ay, que pena! Now the weather is so bad you cannot paint this time.” - “True, not outside! But I could paint your kitchen and you cooking.” And the matter was settled. Now I went to Maria Rosa every evening. She cooked, I painted, we ate, drank sweet Bella Luisa tea together, chatting, laughing and singing - sometimes so uninhibited that the next day her neighbours wondered about the nightly noise in their house. But that did not bother us, we just enjoyed the time together. 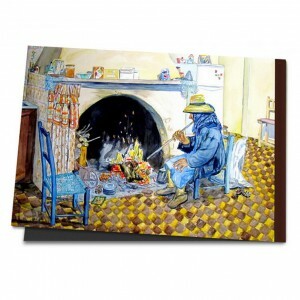 Then this holiday was over as well, the big and for me great picture ‘Winter evening by the fireplace’ was completed. “I leave tomorrow morning,” I said, holding her hands in good faith. “When are you coming again?” Maria Rosa asked me expectantly. I pretended to think. “I'll be back again on your birthday on the 25th of April!” I announced finally but quite decisively, beaming at her. Then she squeezed my hands and I hers and we both felt the anticipation of the other.